Shutter speed is what exactly? Because I’m pretty sure you could never get a picture like that without some serious gear. This isn’t real. The resolution of the inlet and the cub scouts looks different than that of the rest of the photograph, they almost look painted on. And check out the reflections in the water in front of the boy scouts, there’s something off about the trees. Check me if I’m wrong. Wouldn’t that blow up their ear drums? tks tks tks, I expected some of you know what tilt-shift photography is. sadly you don’t but now you do! 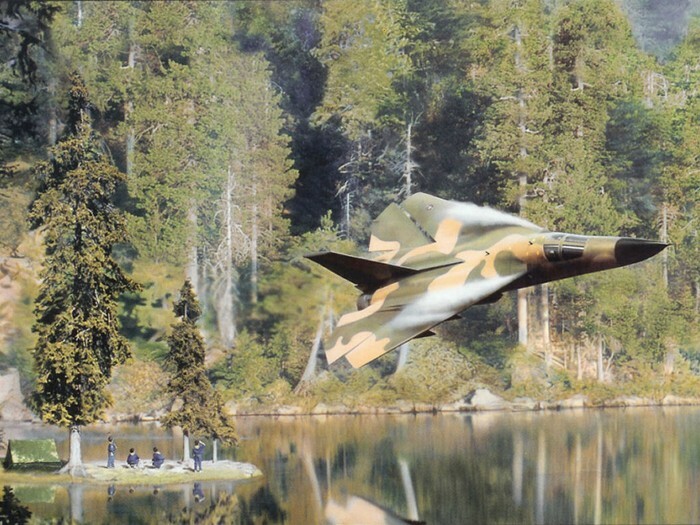 Definitely it’s a shoop, not because of ridiculous fighter jet being above a lake where there is rural mountains around but also that tilt-shift can be achieved with Photoshop with needing the special lens. To answer the original question yes it is an f-111. This also has to be one of the worst shops I have seen in a long time that is not trying to be and obvious shop. I mean realy who is going to buy the boy scouts minatures from a train set in the front and also there is no disturbance of that glass smooth water from the preasure wake of the plane in flight. I don’t even think jets can fly that low anyways. I think if they get that low they kind of get sucked down to the ground, because the air can’t move right or something.